Pound cake is a British invention of the early 18th century, I'm told, and got its name from being made from a pound each of the primary ingredients--eggs, flour, sugar and butter. These proportions have been altered over the years, but I like to make a pound cake that holds as closely to that proportion as possible. I found that using 3/4 pound, rather than a pound, of each of the primary ingredients made the perfect amount of batter for a standard Bundt pan. This is a classic vanilla pound cake with just a hint of brandy or sherry (strictly optional) as well as mace. Not enough to really notice, just enough to add a certain je ne sais quoi to the classic cake. Most days I don't sift flour; I don't know what got into me this morning, but I triple-sifted the dry ingredients. Not sure it was necessary, but what the hey, right? I'm sure my usual whisking the daylights out of them in a large-ish bowl would have sufficed. But, hey, you do whatever you think is right. The main thing is the creaming. Take your time with that step; it pays off big time in the all-important texture of the cake. Don't let your butter sit out for hours and get overly soft. Let it sit out just long enough to be soft but still cool and not at all shiny, oily or melty. And bring the milk and eggs to room temperature before starting the cake. This helps you get the characteristic fine-grained texture. Don't use margarine or any other substitute for the butter. Butter is, along with eggs, the primary flavor of pound cake, so it must have real butter. Then beat it really well on medium speed and then gradually beat in the sugar, taking at least 8 minutes from the time you start creaming the butter until all the sugar is fully incorporated. Then beat in the eggs one at a time on medium speed, beating until incorporated after each addition. But once you start adding the flour, use low speed and take care not to overbeat. I usually finish that step by hand so as not to overbeat. These steps ensure the moist, even crumb that is the hallmark of a classic pound cake. I love a perfectly plain piece of the cake with a cup of tea, but it also is the perfect foil for ice cream and chocolate sauce or berries and whipped cream; and it's my favorite cake to use in Trifle. How do you like to serve pound cake? And, yes, pound cake is supposed to get a crack on top. * That's medium for UK eggs. And if you're using homegrown eggs, that's about 12 ounces or so of eggs in their shells. 1 Preheat oven to 350F/180C/Gas4. Butter and lightly flour, or spray with cooking spray, one 10-inch 12-cup Bundt pan. I use 1 tablespoon of butter and 1 tablespoon of flour and shake out the excess flour. 2 In medium bowl, whisk together flour, baking powder, salt and mace. In 1-cup glass measure, stir together the milk, brandy or sherry, and vanilla extract. Note: If you're going to sift the dry ingredients, don't sift the mace; you'll likely end up with some stuck in the tiny holes of your sieve. 3 In bowl of electric mixer or other large bowl, beat the butter until very light. Beat in the sugar gradually. This step should take a total of not less than 8 minutes. Beat in the eggs one at a time, beating well on medium-high after each addition. Beat mixture until very light and fluffy. 4 Add the dry and wet ingredients alternately to the creamed mixture, starting and ending with the dry. Do not overbeat; overbeating at this point will ruin the cake. Give it a few stirs by hand to incorporate the remaining dry ingredients. 5 Pour batter into prepared pan, smoothing top with spatula, and bake for 60 to 65 minutes or until a toothpick inserted in the center comes out clean. 6 Cool in pan on wire rack for 10 minutes, then turn onto a wire rack and cool completely. The cooled cake can be wrapped tightly and stored at room temperature for up to 5 days. Can be double-wrapped and frozen for a month; thaw, wrapped, at room temperature. Note: In fact, the cake is better if you store it for a day or two before serving. I always love pound cakes...and yours looks perfect, Jean. Next time I bake one, have to try your 3/4 pound recipe. Thank you, Angie. Do let me know how it turns out for you. Hello, Jean - It was nice to meet you at the AIM link up. The foodie in me absolutely loves this recipe! And the nerd is me was intrigued to know where its name came from. Thanks for sharing this. Yes, Sully, baking is as much a science as an art. But even those with a dearth of kitchen appliances can make a perfect pound cake by hand - it just takes more "arm" than I currently have. But if you're just making a doorstop, you can go easy on the beating! Donna, thank you. Maybe that's my main audience, "foodie nerds," since I do like to present the whole story, rather than just a recipe, so that bakers/cooks at any skill level can make a success of it. Oh, this is a keeper. And I especially appreciate the detailed instructions on mixing time, folding, etc. and WHY that matters. So many times we do things and think, "does it matter?" so shortcuts fall into place and it's never quite as right. But the chemistry and understanding of it keeps us on track! Thanks so much, Jeanie. I couldn't have said it better myself! Ingredients are so expensive, it would be a shame to not take just an extra few minutes to make the most of them. Oh, what a wonderful looking cake, Jean! 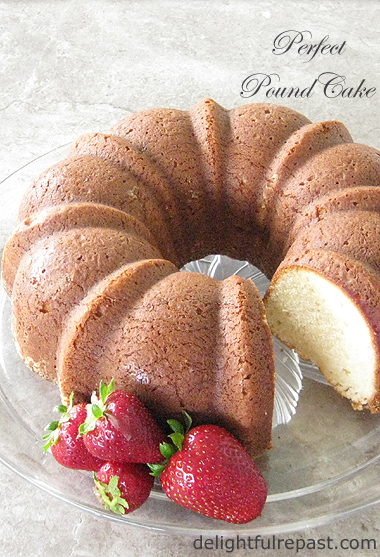 I love pound cake because it can be served plain or with so many other things. Wish I could have a slice of yours! Once I get my gallbladder taken care of, I'm going to have a big feast. ;-) Thank you for your nice comment and have a lovely weekend. Yes please Jean, I'd love a slice of your pound cake with some sliced strawberries, whipped cream, and a cup of tea. We could sit and chat awhile , and that would make me perfectly happy. Hi Jean, that looks like the perfect Pound cake to me! I will definitively try out your recipe! I really appreciate that you are so detailed with the ingredients and with the recipe instructions. I will follow them to a T and hope my cake comes out as good as yours. 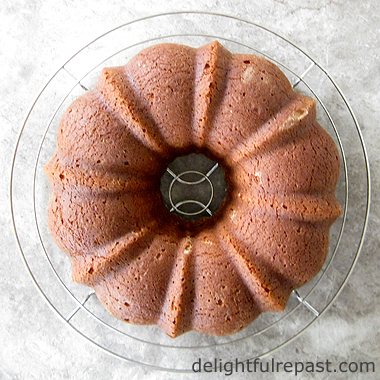 Love your Bundt cake pan! Could you please share where you got it? Thanks! Thanks, Martha Ellen! And I doubt that I'll sift the next time. I've been just whisking instead of sifting for decades, so I don't know why I decided to sift. I don't think it made a bit of difference. Sandi, that sounds like a wonderful plan! Have a post-cholecystectomy tea party! This looks a lovely recipe for the next miserable day outside; I've pinned it so I can find it right away again. I think a slice with some nice peaches & a cuppa would be wonderful. Kitty, that would be so wonderful to be able to have cake and tea and a chin-wag with you! Christina, thank you. My Bundt pan is ancient! I put a link to the same brand and size of Bundt pan in the post. If you follow that link, you'll be able to see the Bundt pan I would buy today and also other ones that might be similar to the one I have. Let me know how your pound cake turn out! Mrs Shoes, it IS perfect with peaches! Can't wait for peach season to start. I'm having a piece (plain) with a cup of tea as I'm typing this! Hi Jean! MMmmmmmm! It looks perfect! I've never made one but yours looks yummy. Thanks for sharing at #WednesdayAIMLinkParty. I shared it on social media. These are killer pound cake Jean. I love the fact that you didn't add any drizzle or ganache. 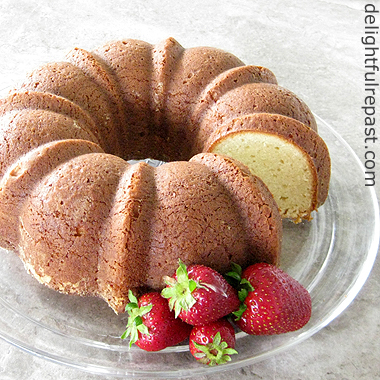 Simple and naked pound cake but delicious. pinning and tweeting. Thanks, Grammy Dee! And I soooo appreciate the social media shares! Swathi, thank you so much! And I love the way you put that. TY, too, for the Pin and tweet! Well, that sounds good, too, Cheryl! Make mine decaf, though; regular coffee makes me crazy! Great post, I love pound cake. I found your post at the Blogger's Pit Stop Linky Party. Thank you, Robbie! I hope you'll give it a try. I had no idea this was a British cake - I don't think I'd heard of it before I arrived in the US. I can definitely see this with strawberries, but peaches or maybe even mango would be fun, too. Pauline, maybe sometime over the past 300 years the Brits stopped making it or started calling it something else! Yes, mangoes - I had a couple of really good ones a few weeks ago, would be a wonderful combination. I think I must pin this one. It is wonderful to gather good pound cake recipes. They are my favorites. Thanks, Vee! Pins are always appreciated! A delicious looking pound cake Jean, thanks for the recipe. Thank you, Judith. I know you would enjoy it with a cup of tea! This pound cake looks delicious. Pinning to my Baked Goods board Thanks for sharing your recipe. Please link your posts on my Sunday's Best linky party. Good recipes are always welcome. Thank you, Rhonda. And thanks for the invitation; I'll pop over and do that now! It was interesting to learn the origins of the pound cake's name. I would definitely enjoy it with a cup of tea. I like the idea of having an oversized teapot. But like you, I prefer to use multiple regular-sized teapots. This way, you can serve different types of teas. Thanks, Margie. I like to add a little detail like that when I can. Even when serving tea to a crowd with multiple pots, I'd probably limit the choices to two or definitely not more than three. I like the whole concept of "pound cake" Jean. Nice and simple. Not many know what a ,"pound," is nowadays,though Jean. We do teach Imperial measures in school but really we just use metric measurements. Rather perversely we still measure driving distances in miles. On a map however we use kilometers, meters and centimeters. Does this sound confusing? Well, we don't think so, anymore,Ha! Ha!. Thanks, Tony. I didn't mind too much when Britain switched to metric, but I was really upset when I learned they changed the money! I was really attached to the shillings! Wow, Jean - what a beautiful cake and recipe. I have never made a pound cake - hard to believe, eh? This will be my first... My mother used to slice hers horizontally (she made them in loaf pans) and then alternate layers of raspberry and apricot jams and then glaze the whole thing with ganache. I might have to try that with your recipe! Thanks, David! I like the loaf cake as well. And your mother's embellished cake sounds perfect for a special occasion! That cake is so beautiful, Jean! Wow! Pound cake is a favorite of mine and so I appreciate all your tips to improve the texture so I can make it even better. Thank you so much. Lily, thank *you* so much! It's good with a cup of coffee (decaf), too, though I of course more often have tea. Love and hugs! Thank you, Karen. Pan size is so important in baking. If pan is too big, you end up with a flat, possibly overbaked cake. If pan is too small, you end up with a big pouffy muffin top or even with overflowing batter. Greg, I've played around with replacing part of the butter with organic canola oil and liked it quite well. But I've not yet experimented with the melted butter. I've wanted to for a long time, but then I just go with the tried and true. I agree - it's fun to explore! I do love pound cake even though I've never made it. Don't know why it intimidates me but your post inspires me to try. Thanks! Carol, thank you. 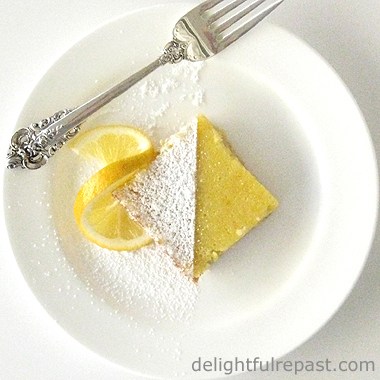 I hope you'll try it soon - it's great with a little citrus zest, too - and let me know how it went! Thank you, dear Janice. I do hope you'll like it as much as we do! And I hope you have a great week, too. Cristina, thanks! I hesitated to use the word 'perfect'! Oh, I love a nice plain cake. I often make a one-bowl recipe called "Busy Day Cake" that I like to eat plain. My family likes it with strawberries and cream. I love how pretty a bundt cake is, though. I'll have to try this one for company ;) Thanks, Jean. Ruth, thank you. And I'm glad to find out you're one of my fellow plain cake fans! Frosting is just too much sweetness for me. Thank you, Polly. Isn't it wonderful to just whisk instead of sieve the flour?! Thank you, Menaka. And it's all organic, except the sherry! Thanks, Laura. I make quite a bit of gluten-free but haven't made a GF pound cake, but I would try a combination of 130 grams sorghum flour, 130 grams potato starch, 90 grams tapioca flour and 1 to 1 1/2 teaspoons xanthan gum. Thanks, Jeannee! 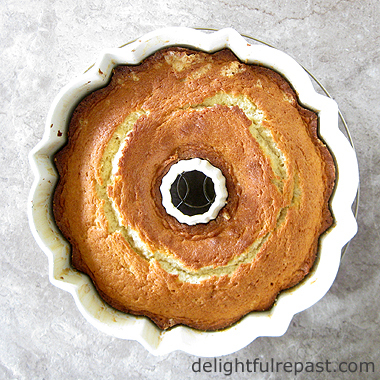 I more often make my pound cakes in loaf pans, but I just must have a Bundt every so often. I love pound cake and haven't made one in several years - not only your recipe but your thorough tips make me eager to do one soon! Thanks so much for sharing with Awesome Life Friday. Lynda, that makes me so happy! If you get a chance to try it, I hope you'll let me know how it turned out for you. This is just perfect for a spring brunch! Thanks for sharing at Tasty Tuesdays this week. Gina, thank you. I do love a nice spring brunch! There's nothing like a good pound cake, and yours looks so lovely, Jean! Great tips and I love the idea of adding brandy or sherry too. Shared on the H&S Facebook page and scheduled to tweet. Thank you so much for being a part of Hearth and Soul. Thank you, April. Much appreciated - love Hearth and Soul!